Wouldn't it be nice, if parents said they were sorry to people near them when their kids' noise or kicking the back of your pew, not being told to stop, had wrecked their prayer at Mass? It all relies on parents understanding that for many of the elderly present, just hearing what is said when no children are present is almost impossible. Age = impaired hearing and vision, and even Holy Mass is a challenge. Add to that a child crying or moving around significantly on the pew, and this will mean Mass will not be heard. This may be for some their last Holy Mass. It is necessary to be extremely considerate of others when you bring your child to Mass. The child should be old enough to be quiet, or if not, you should be considerate and responsible enough to quietly remove your child if they become too noisy. This is Common Sense and Manners 101. Your comments on the liturgy were especially relevant to the discussion, Dr. Shaw. 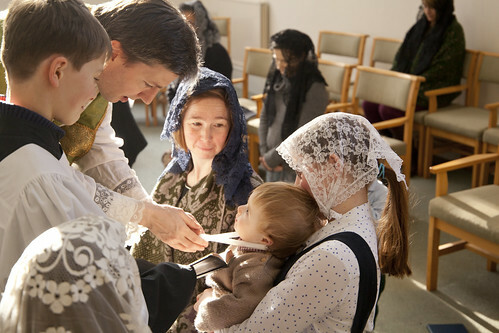 The other thing to consider is that children will only refrain from receiving Holy Communion in the Roman Church; in the Eastern Catholic Churches, children receive that Sacrament from the time of their baptism as infants. This gives a different context as to why children are there. We must always strive to remember that the Catholic Church is not synonymous with the *Roman* Catholic Church. You are absolutely right, Kathleen. It's not the children who are the problem, it's what we as parents have turned them into. Of course, children should be at Mass, but parents should be respectful towards other members of the congregation. It is hard to see this happening in today's culture, but there are families who still seem able to keep their children quietly engaged during Mass, or take them out for a short break. The sad thing is that people seeking some solace and meaning in the liturgy are seen as anti-child miseries! There is no understanding of the sorrow a disrupted Mass can cause. Sad days, that have only recently become commonplace. Doesn't Fr. White believe that the Mass is a propitiary sacrifice offered up for the living and the dead (the living including children presumably!)? ; does he think that those who don't receive Holy Communion cannot benefit from the Mass?-It sounds as though his theology should be under scrutiny, not the children.